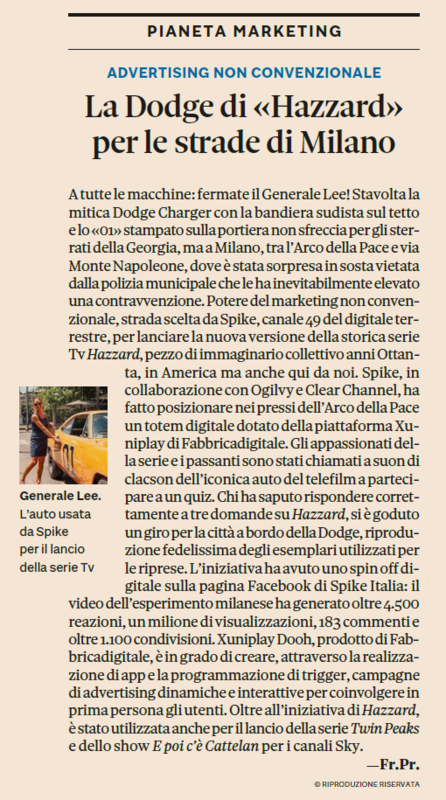 Last July 6th, we collaborated with Clear Channel Italia and Ogilvy for the relaunch of the famous TV show Hazzard on Spike Tv. The customer, the TV channel Spike Tv, thought of a great promotion by engaging people directly. We broadcasted a quiz about Hazzard on a digital and touch point in the city center of Milan; people around it could play and get the answers in real-time. The reward? An exciting drive on General Lee car.